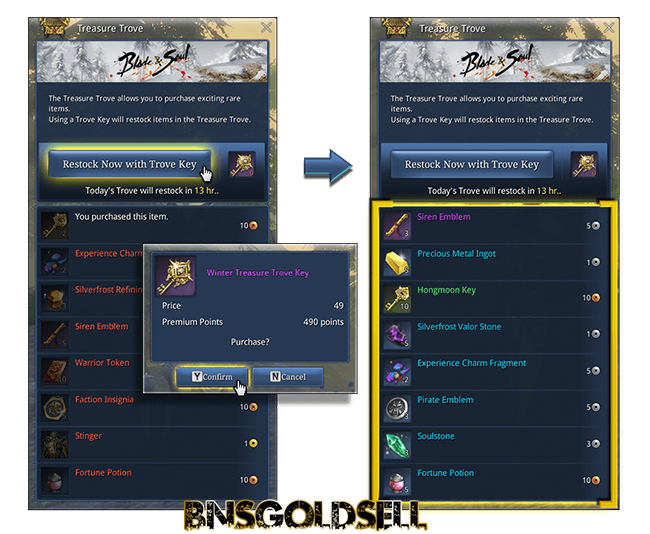 The Treasure Trove can be opened for each of your characters level 36 and above in Blade and Soul. This event will be end on March 22. 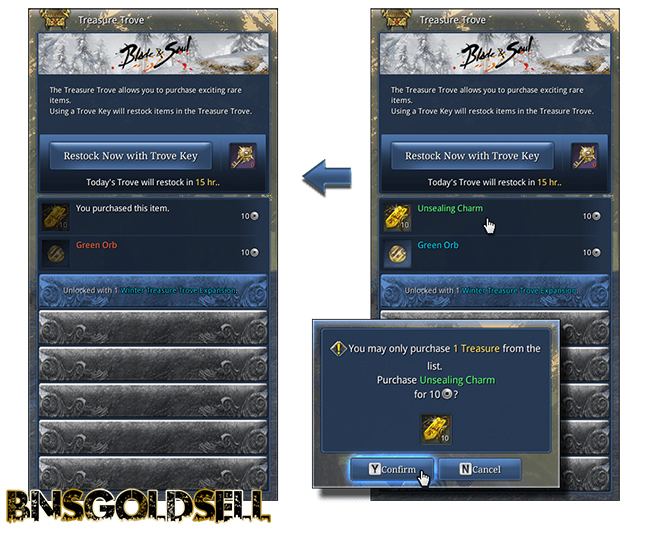 You can buy only one item from the Trove with Blade and Soul gold. Do you need more choice? 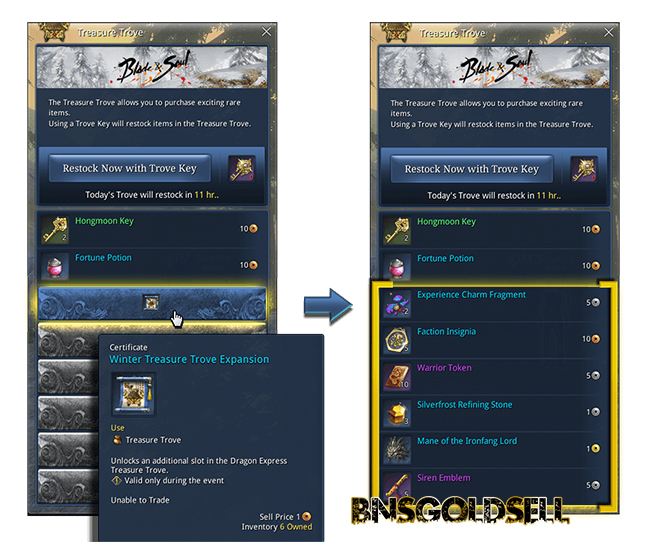 Just buy Slot Expansions in the Hongmoon Store for each of your characters. 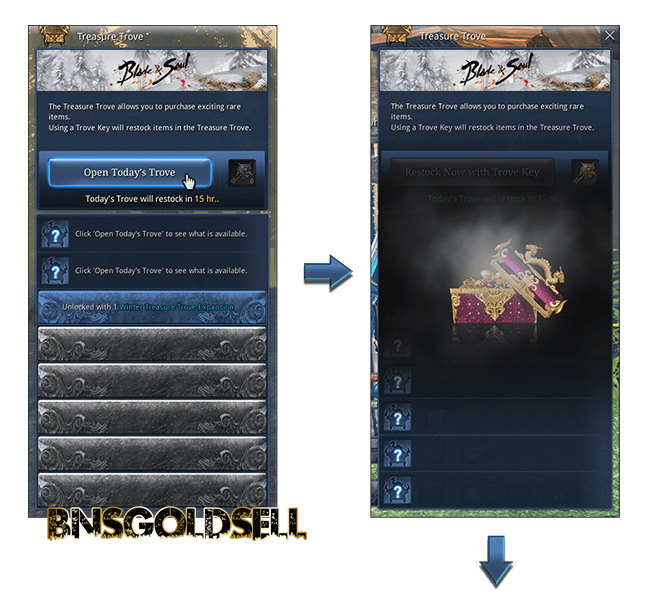 It is cheap to buy Blade and Soul gold from BNSGoldSell, then you can purchase lot Expansions for your characters. Do you want more chances to see what the Treasure Trove can offer you? 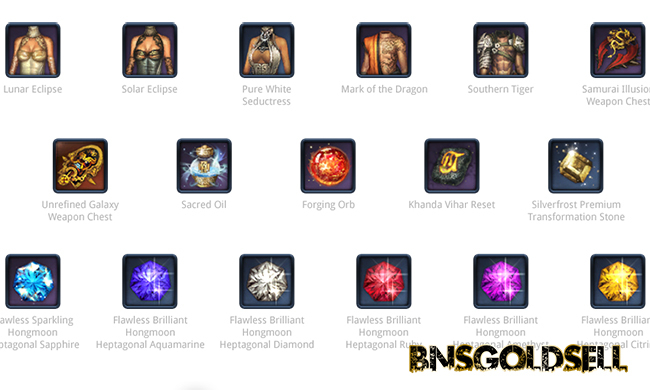 Just buy Blade and Soul gold from BNSGoldSell to purchase additional keys in the Hongmoon Store. You have a chance to get rare gems, materials to upgrade your weapons and gear, and exclusive costumes and more. Rare gems and materials are below! Lunar Eclipse, Solar Eclipse, Pure While Seductress, Mark of the Dragon, Southern Tiger, Samurai Illusion Weapon Chest, Unrefined Galaxy Weapon Chest, Sacred Oil, Forging Orb, Khanda Vihar Reset, Silverfroest Premimum Transformation Stone, Flawless Sparkling Hongmoon Heptagonal Sapphire, Flawless Brilliant Hongmoon Heptagonal Aquamairne, Flawless Brilliant Hongmoon Heptagonal Amethyst, Flawless Brilliant Hongmoon Heptagonal Citrine.